Cold cold cold. Tokyo is dripping in bleak rain today, and my spirits (and an incessant hangover) have yet to be lifted. This week's column is called Jomon Ceramics Now. The title, in itself, might sound like a bumbling oxymoron. Jomon pottery is the oldest recorded earthenware in the history of man, dating back approximately 12,000 years from today. That's a long time ago. And to coin a "now" next to Jomon will probably make you shrug your shoulders and wonder why. I find in Jomon a primitive, primordial energy that fascinates beyond compare. Not only is it the genesis of Japanese ceramics, but it is one of the first instances of man's flirtations with science, industry, and art. And personally, I find in Jomon the limitations of our so-called humanity. We believe that science is the new religion, and that it can help explain much of the mysteries of the world. Yet the strength of our science can hardly unravel the history of clay pots from a civilization that, to me, appears much more advanced than how history depicts it to be. A single glance at the elaborately decorated artifacts on this page sends a deep and probing, enigmatic calling. I believe we are looking at the work of a civilization that cannot be simply pigeonholed as Japanese. Who were our ancestors, and what moved them to physically create such bizarre and curious, brilliant and imaginative representations of some deity or life form not recorded in history? I write of Jomon Ceramics Now, as the mysteries of Jomon have hardly been tapped to this day. We search for clues, but are left clueless. 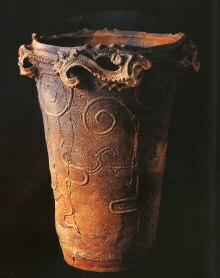 Little is known about Jomon pottery. Many will be surprised to find that Jomon was first excavated by the American Edward S. Morse in 1877, 9 years after the Meiji Restoration. It was Morse who discovered earthenware that appeared to date from the Stone Age, along with human remains and stone tools. The advent of stratigraphic dating in later years, or the analyzing of rock and sedimentary strata, evidenced that the geographic layer in which the earthenware was found was considerably older than any sedimentary layer found in the early civilizations of the world, including Egypt and China. Skeptics could hardly shut their mouths, as the Japanese archipelago was hardly a nestling ground for great civilizations. I too am skeptical, but for different reasons. I find it hard to believe that Japan saw a flourishing of technological and artistic advances from 10,000 BC to 300 BC, for from 300 BC to 300 AD (the Yayoi period) we see not an upward advancement, but rather, a degradation of the techniques and crafts from the previous age. 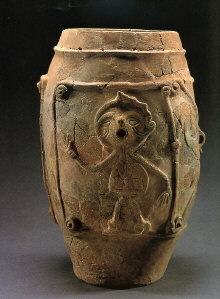 Yayoi pottery is hardly as elaborate or decorative, and not a single dogu, or clay figurine, is found in the Yayoi. If these dogu were made as religious symbols, a previously important religion must have died out along with it. 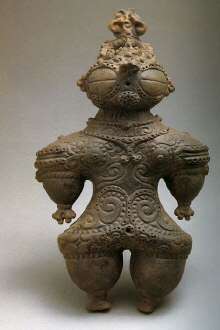 Or, as I speculate, the Yayoi man neither had the artistry, technology, nor the religion of the Jomon man. In other words, they seem to be two different races, with two completely different levels of culture. The Jomon man almost seems to have had a far superior culture than the Yayoi man who was born after him. Of course, I am neither an archeologist nor historian, and I do not purport to exclaim an utter and invariable truth. This observation, or rather, the questioning of our history, comes more from a gut feeling that I receive when looking at the excellence of Jomon pottery. Jomon pottery reaches a zenith of artistic beauty in the middle Jomon, and its legacy mysteriously vanishes as we enter the Yayoi. 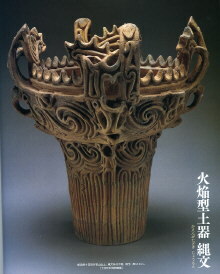 It is not until the advent of Hajiki and Sueki wares from Korea in the 5 to 6th centuries AD that we see a new progression in Japanese pottery, especially with the arrival of the potter's wheel and high-temperature kiln firing (which were both techniques from the continent; see Timeline for more). 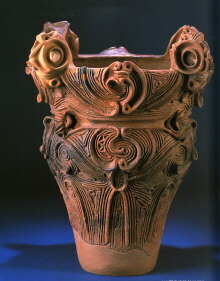 Unlike the earthenware of China and Korea, Jomon pottery was made through clay coiling, decorated by imprinting rope patterns on the clay body (hence the name Jomon), and were fired in ditches at temperatures of only 500 to 700 degrees Celsius. 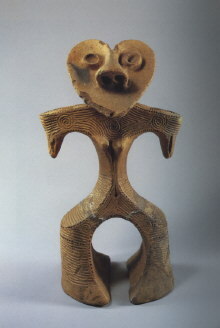 These techniques are considerably older and more primitive techniques, but were indigenous and original techniques developed well before the emergence of pottery in other continents. Were the early Japanese so advanced, even when we think of them as simple-minded, nomadic hunter/gatherers? The ability to collect, preserve, and cook food with earthenware was surely a huge step for civilization. But if Jomon culture were a primitive look at early man, why would they need to decorate their pottery? It seems as if aesthetics was a large factor in the way they made their pots. 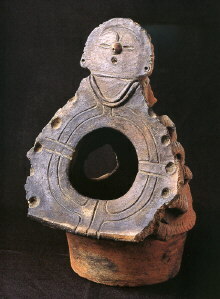 And moreover, utility was hardly the focus for such sculptural works as the dogu, or wares such as incense burners. These were undoubtedly religious or talismanic objects, but are made with an extreme and compelling eye for detail and craftsmanship. Could a primitive culture have made, or rather, even dreamed of such artistically advanced earthenware? 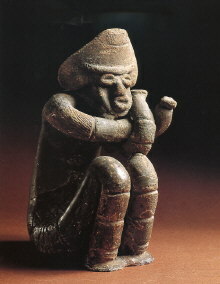 The shako dogu, for example, appears to be wearing some sort of armor or clothing that is unlike anything seen throughout history. What sort of mind could have imagined such a thing, especially if the culture had no conception of clothing aside from the hides of beasts? 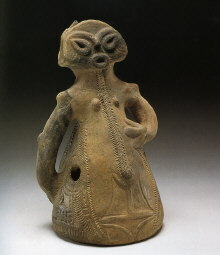 And even if such a primitive mind could dream of such a decorative figure, isn't it incredible to think that the early mind of Jomon man could actually materialize the internal image into a clay figurine? And this is not simply one person's doing. A handful of dogu that look extremely similar to the shako dogu has been excavated in numerous locales throughout northern Japan. In other words, a single clan or group did not concoct a singular image in his head. It seems, rather, that the image was readily accepted by all clans that lived in Japan at the time. The figure might have been, in other words, common knowledge. 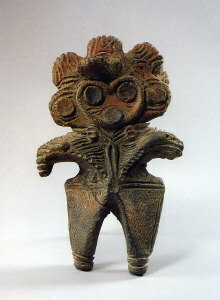 The same goes for the heart-shaped head dogu, as similar figures have been excavated as well. Is this evidence of a common religion, or does this underlie a culture that might have had far greater advancements and artistic/aesthetic intentions than previously thought? This week's column is intended to perplex, rather than to explain. For this, I take full responsibility. It is a brain tease more than anything else. Words may not explain much of the enigma (and stigma) that surrounds Jomon wares. But explanations can often be dull. And so, for now, I will let the pottery speak for itself. They speak deep and beautiful tales indeed.